A panel of developers told city leaders this week that extensive haggling with neighborhood organizations is making it difficult to build new projects in Minneapolis. Several council members and staffers with the city's development agency attended Tuesday's City Hall discussion, organized by the Urban Land Institute of Minnesota. Panelists represented commercial and residential real estate firms, as well as outside other development areas. Panelists said they often incur substantial costs to a project trying to win approval from one of the city’s 81 neighborhoods — each of which operates in a slightly different manner — sometimes only to have it all collapse. They asked for more support from City Hall in wading through the process. "The one thing that we can no longer afford to do…is waste time and money," said John Breitinger, vice president of United Properties. "Our pursuit cost budgets have gotten completely out of control." Patrick Mascia, a real estate attorney who asked some local developers of their opinions, observed that different people may show up at five meetings with a neighborhood group. Council Member Lisa Bender, chair of the city's zoning and planning committee, agreed there needs to be more consistency in the development process across the city. 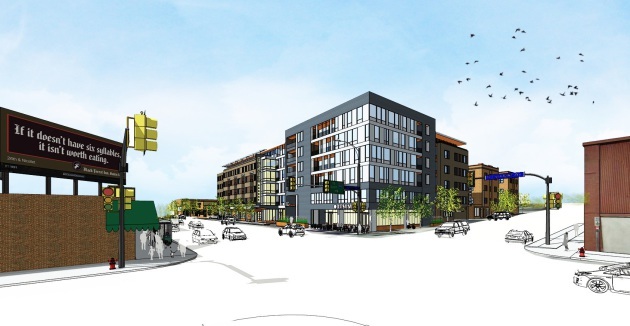 Above: A proposed development at Lyndale and Franklin Avenues, which ran into fierce opposition from the Wedge neighborhood group. She noted there is no requirement to seek approvals from neighborhood groups. Many people believe there is, however, prompting developers to seek neighborhood sign-off before consulting extensively with staff about a project. Bender added that the neighborhood organizations in her ward largely do not represent the majority of her constituents. Gina Ciganik, a vice president with non-profit developer Aeon, said she has walked into neighborhood meetings where the agenda listed a motion to deny her project before any discussion of it. She also cited a project where the neighborhood demanded that a certain water heater be installed in new residential units. Council Member Cam Gordon said developers should take the time for a short meeting at City Hall before investing very much in a project. “Sometimes I think the developer feels like they need to figure out what we’re actually going to build there, have some really good design drawings, have some cost estimates, have an understanding of what kind of public subsidy we might need and all these ducks in a row, when really we just want to have a conversation," Gordon said. He added that neighborhood associations are often striving to have a "higher purpose and a mission" rather than merely bending to the interests of the development community. In his ward, that has taken the form of student housing in recent years. Council Member Andrew Johnson said some neighborhood groups try to veto projects, while others work with developers, identify sites and champion projects. "I would love to personally take on that aspect in trying to get some consistency there," Johnson said. The panel said that other burdensome areas of the city's development process include the zoning code and funding affordable housing. Ciganik said her affordable housing projects, which require public help, often rely on 10, 15 or even 30 separate sources of funding. In one project, Aeon tapped nine funding sources from the city of Minneapolis alone, including tax increment financing, affordable trust fund dollars and others. She said that construction costs often account for only 50 to 60 percent of their total project expenses because of the process. Market rate projects are closer to 80 percent, she added. Max Musicant, whose Musicant Group helps communities activate public places, said an overly complicated process can shut out the smaller players. Gordon said that would also help council members and neighborhood organizations by outlining the parameters of a development debate. "I always like to start with a description of here’s what they can legally do at this property," Gordon said. "Here’s the three little extra things they might want to do if there’s a variance or a conditional use permit. And [those extra things are] what we get to talk about as a neighborhood or as a planning commission or as a staff."